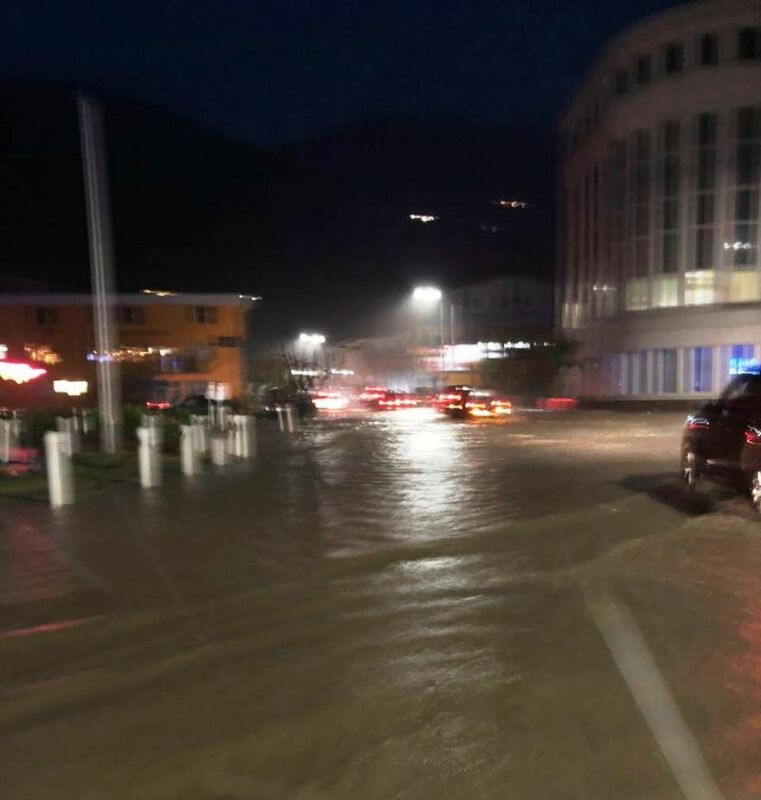 The rains and flooding lasted into the night, a result of the lingering weather system. This was the case along the James Walter Francis Drive, in the vicinities of the Road Town Festival Ground and Delta Petroleum at Pasea Estate. 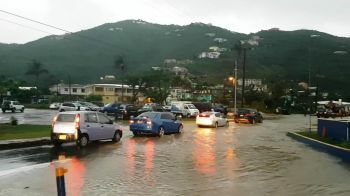 In the case of the Delta Petroleum at Pasea Estate, reporters from Virgin Islands News Online documented the constant rise and fall of flood waters. 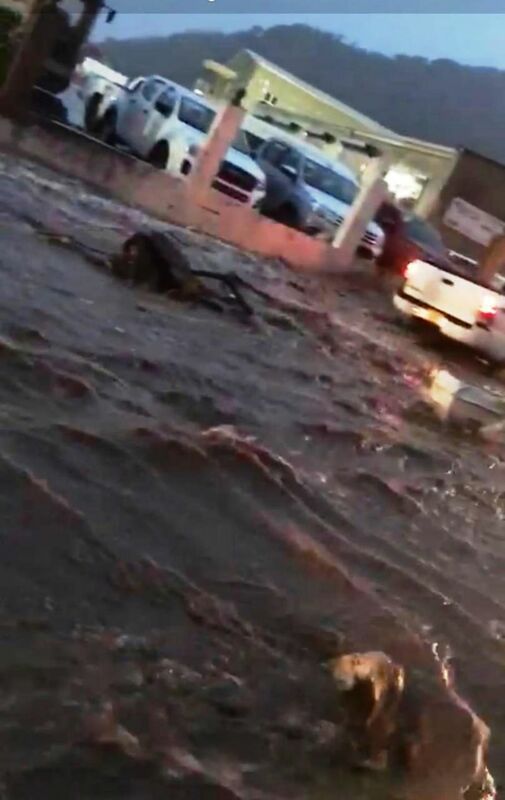 The flood waters at times, caused the eastward bound double lane roadway, to be transformed into a single lane as drivers attempted to avoid the higher sections of the flooded road. “This is giving me the creeps,” one driver who gave his name only as Sorrentino, as he got out his vehicle to examine the scene. “This is not as bad as what happened here last year, they did a very good job with that ghut but mehson, the water is way too much,” he added. Up to late last night (August 30, 2018) there were reports of flood waters posing a threat to several businesses especially in Pockwood Pond in the vicinity of the R and R Malone Complex, a major section of Waterfront Drive, Road Town, West End and East End Tortola. Let’s look at the positive side of this: The drains was clear not long after Irma (or so we was told, yet we seen photos of people and machines cleaning it) -we had no rain like this to see if the drains are actually clear. We seen yesterday how quick the place got flooded out. We see Irma garbage floating in the roads etc | we also saw the little man made hole (water drains) not big enough to filter the water through without over flowing the roads etc. Now it’s good time for the minister of communications and works to read between the lines and get it sorted out ASAP. It will also help if humans can stop throwing TV’s / mattress/ strove etc into our guts so the drains could be cleaned. Why the hell you people have to always mention NDP in everything that is going South in this place. The damn roads is going to remain the same or worse QC if the VIP bunch gets in office. The only VIP I can say who is on his grind is Andrew. Improving the drainage infrastructure is another high priority item for the BVI. Increasingly, nuisance flooding is becoming a problem in the VI, impacting residences, businesses, roads, traffic ......etc. Does it seems now that whenever a cloud makes up the BVI floods? The question is what is causing the increasing flooding and how to mitigate it? Rain moves from a higher elevation to a lower elevation, ie, from up hill down hill. In a drainage basin (watershed), runoff is channeled into ghuts, ditches, creeks, streams, rivers ........etc created by nature on its way generally out to sea. Interruption of this flow can result in flooding, ie, blocking ghuts, poorly maintained ghuts.......etc. Further, growth produces more hard surfaces, resulting in less runoff infiltrating into the ground, larger volume running off at a greater velocity. Poor drainage planning results in areas that didn’t flood before development flooding after development. Moreover, to mitigate the increasing flooding, a drainage system (ghuts, pipes, ditches, inlets, manholes, catch basins, culverts, bridges....etc) must be designed and constructed to collect and convey runoff safely out to sea. The system should be designed to handle frequent rain events, ie, 2-year, 5-year, 10-year.......etc, along with less frequent rain events, ie, a 100- year rain event. What does a 100-year event means? It theoretically means that a 100-year rain has a 1% chance of occuring every year; nonetheless, the reality is that a 100-year rain can occur at any time. Will a well-designed and constructed drainage system solve the flooding problem? Defining the difference between hydraulics and hydrology can be confusing. Hydraulics is the physics of water, ie, the conveyance of water in pipes, pressures in components......etc; whereas, hydrology is about geography and geology, ie, water cycle.....etc. Nonetheless, hydraulics and hydrology are the province of engineers, ministries ...etc. Residents care about flood waters flowing into their homes and businesses and spreading and ponding on roads. Of late, there are more serious flooding in the territory. What is causing the increasing incidents of serious flooding? For the most part, growth and development, coupled with poor drainage infrastructure planning, design, construction and maintenance, contribute to flooding. Like water and wastewater, stormwater is the third leg of the water triangle. As such, it must be treated as a utility with the same attention, investment, care and feeding .......etc as its brethren water and wastewater. In the VI, the only precipitation that has to be concerned about is rain. Thus, it must be effectively managed from the time the first drop hits the watershed to the last drop that is discharged into the sea. In big countries, surface runoff can take days, weeks, months or even years to reach the sea. However, in a small territory like the BVI, it takes less than an 60 minutes for runoff to roar down Great Mountain Ghut, Long Bush Ghut, Johnson Ghut......etc. These ghuts must be kept clean and unobstructed. A permit should be required to fill in any ghut; this is to ensure there are proper work around or diversion of flow.